Summer is coming to an end and children are bound to feel nervous. But as a parent, you don’t have to fear the start of the new school year. There are steps you can take to assess where your child is in their academic development and figure out how you can best help them prepare for the months of fun, challenges and learning ahead. Though some parents have been looking forward to the back to school season all summer long, since now they will have some free time of their own, it's important to understand how crucial it is for children to be well prepared for the start of the new school year. There are steps you can take to assess where your child is in their academic development and figure out how they can best prepare for the months of fun, challenges and learning ahead. To start with, it’s important for parents to see what critical skills the child learned the previous year, so they can be sure their kids are ready to learn new topics, Windy Lopez-Aflitto, Director of Content and Partnerships for Learning Heroes, a non-profit educational organization, told Univision Noticias. Up to 90% of parents think their child is at grade level, but only 39% of teachers say the same about their students. That is why it is crucial to support children from the beginning of the year and as a seamless part of daily life. To accomplish this, Learning Heroes launched the Readiness Check, a new tool for parents, developed by math and reading experts, available in English and Spanish, to see how well your child handles the basic skills appropriate to their level. You will also find free and interactive resources and tools to help you do this from home or on the go. An important step in this process is to look at the results of the annual standardized state test from last year. If you haven’t received the results yet, talk to your child's teacher. How does the Readiness Check work? Ask your child to answer three to five questions in reading and math, as a quick review of the previous year. Remember it’s not a test --your child can relax and solve the problems, just like a game. 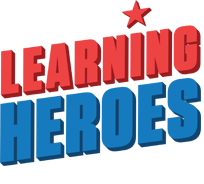 In the end, you will receive fun and free activities to help your child, like videos and games from Learning Heroes partner organizations, like Khan Academy. "We've seen that parents sometimes don’t feel confident teaching, especially math," Lopez-Aflitto said, “the tool is there so they don’t feel nervous." It is meant for parents who see their child needs help, and in cases when, although they might not know or remember the material, or they learned it in a different way, the child can still learn and practice it any time, on their computer, cell phone or tablet. The tool is based on standardized state tests and all instructions are in Spanish. The math questions are in English and Spanish for children to learn and practice English as well. It also includes a glossary of important words to understand the reading. Once parents check whether their child learned the skills appropriate for their level, it’s important to chat with the teacher, so that they also know what type of support they can provide in the classroom. Research shows teachers can take up to four to six weeks reteaching the skills and concepts from the previous year, on top of having to learn around 30 new faces and names, their strengths and weaknesses. When parents use this tool, they can share the results with the teacher to get a type of support that is more specific and efficient. 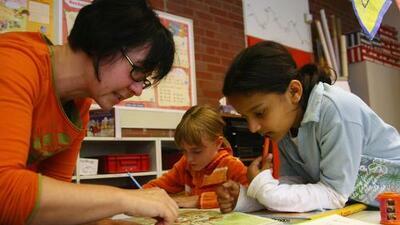 Experts advise booking an appointment with your child’s teacher at the beginning of the school year. You don’t have to wait until the Parent-Teacher Association, or PTA, meetings, which don’t start until October. By then, four to six weeks of school have already gone by, and some of the weak spots in their academic learning could have already been overlooked and could be accentuating. Sometimes these PTA meetings are too short, even when there is a lot of material to cover. A face-to-face meeting is the best way to support the child as a team, parents and teachers together, from the beginning of the year. In your first meeting with the teacher, bring your child’s standardized test results and ask what they mean in the context of this new year. Find out what is expected of your child and what you can do from home to support them. Help the teacher get to know your child: share their interests, strengths and what you learned during the Readiness Check. Learning happens throughout life and can happen at any moment, even when you’re having fun. Teach your kids how exciting learning can be. Read together about topics that they find interesting. Find math in everyday life and turn it into a game. Learn to remove stress from doing homework and chores. These learning tools, for both students and parents, include games, activities and videos from educational organizations like GreatSchools, Scholastic, Zearn, and others. Help your child realize that sustained effort leads to success --what is also known as a growth mindset, instead of a static one. Focus on the persistence and determination they put on accomplishing tasks and in what they are learning while they do so. This helps them feel less nervous when they have to face new or challenging tasks or subjects. Real-life strengths like communication, problem solving and self-confidence will help your child both at school and in everyday life. Have an honest talk with them about their feelings and how they handle situations, particularly the difficult ones. Esta historia fue producida en colaboración con Learning Heroes. ¿Cómo ayudar en el regreso a clases?